You can keep your smiley, sunny cheerful Cabbage Patch Kids, and your adorable, roly poly Popples, but you were not an awesome kid of the 80’s if you did not get on the Garbage Pail Kids wagon as it trundled through your childhood. That wagon rambled through stealing your innocence and replacing those trusting doe-eyes with some heavy skepticism. I loved them! Of course I did, it was the collector’s card version of ‘Happy Tree Friends‘ in a sense. They should be cute, should be safe, but they turn on you like a good ‘Goosebumps‘ novel would. GPK’s were the in-your-face response to the aforementioned Cabbage Patch Kids craze that celebrated cuteness and like anything our parents deemed too gross or disgusting, the more glorious our search for these cards became. The Holy Grail was a shiny pack of brand new cards just waiting to be explored, would you get that coveted card none of your friends could get and you were all in a secret race to be the first? My love of GPK made me lose sight of the true reason I’m here. 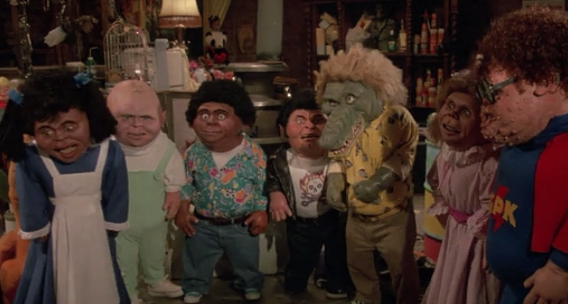 ‘The Garbage Pail Kids Movie‘!!! No, they’re not giving this one a remake…yet. Being panned as one of the worst flicks made would make you think it will be safe, but who really knows at this point, right? 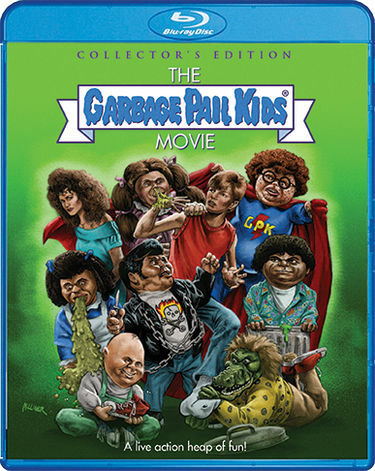 I’m talking about the original GPK movie from 1987 that brought those awesomely creepy creations to life, well movie-life, and it’s being re-released with all the glory a high-definition blu-ray could proffer. On December 8, you can get your hands on the disgusting kids that brought those cards to life, they may be oozing nasty substances, made of green mud and the last thing they want is to be controlled by the dude that created them. Who wants to live without TV or candy? Not these kids and they do something about it. If you’re up for it they’ve got all the snot, farts and vomit you can take in a film that personifies “gross-out humor”, couple the nastiness of the GPKs then throw in the dreamy Mackenzie Astin (‘Iron Will‘) as a perfectly normal, nice teenager, Dodger, who happens to stumble upon these mutants. Just as any nice kid would do when they see someone in a bad situation, he wants to help and releases the GPK from their magical trash can prison when all hell breaks loose. Being the good kid he is Dodger becomes fond of the misfit crew and he joins them to fight against thuggish bullies, their combined efforts just might land them behind bars at the State Home for the Ugly! Co-starring with Astin are Phil Fondacaro (‘Troll‘), Katie Barberi (‘Ferris Bueller’s Day Off‘) and singer/songwriter Anthony Newley (‘Doctor Dolittle). As any good re-release does, this one is packed with some awesome bonus features. Bottom line – Pick this one up! Your kids just might believe you were cool at one point. This entry was posted on Tuesday, November 17th, 2015 at 1:02 pm	and is filed under Film, News, Television. You can follow any responses to this entry through the RSS 2.0 feed. You can skip to the end and leave a response. Pinging is currently not allowed. « ‘Memento’ Is The Newest Title On The Block For Remake!!! He said that faith is like a glass of water. When you're young, the glass is small, and it's easy to fill up. But the older you get, the bigger the glass gets, and the same amount of liquid doesn't fill it anymore. Periodically, the glass has to be refilled. You're suggesting I need to get filled? In more ways than one. You need to get laid, Bethany Sloane. You need a man, if only for ten minutes. It's been my experience that the average male is never a man. Not even for ten minutes in his entire lifespan. That'a a bit militant. You thinking of joining the other side? Then YOU need to go back to church and ask God for a third option. I think that God is dead.